Simi Valley High School is in the city of Simi Valley, which nestles in the Santa Susana Mountains and is adjacent to the San Fernando Valley, part of the city and county of Los Angeles. The city of Simi Valley is closely associated with Los Angeles, since many local residents work in the San Fernando Valley and other parts of Los Angeles County and beyond. Established in 1920 as the first high school in the valley, Simi Valley High School has undergone several configurations over the years to become the 50.4-acre campus it is today. The current campus was built in three phases during the 1960's. Based on the physical concept of "schools-within-a-school," Simi Valley High School was constructed with three instructional quads, each having an administrative area. The original design also included one main administration building. Currently Simi Valley High is configured with five major instructional areas, a multipurpose building, a gym and dressing room facilities, a library, a counseling facility, an administration building, three areas of portable classrooms, a stadium and athletic fields, and a senior patio. 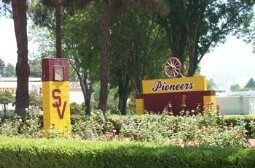 Simi High’s traditional colors are Maroon and Gold. These colors are evident throughout the entire campus. The crest of Simi High is displayed on the outside of the gymnasium facing the quad. The land grant, halberd and arrow represent the early Indian and Spanish heritage of Simi Valley; the torch and atom symbolize education. The cross and the mountains represent the missionaries who once traveled through the valley. The orange depicts the citrus crops; and, of course, the covered wagon represents the PIONEERS who settled our valley. all our live long days!